I recently moved house. Living in Cape Town I have managed to built up a pretty good collection of local wine. One by one I pulled out each bottle from my old wooden wine rack (which I once saved from someone chucking out!!!) and covered them in bubble wrap, in preparation for the big move! Within the collection was one very special bottle that I knew I would eventually re discover. I'm not sure that I will ever drink it. Not because of the wine inside (I don't even know what wine is inside! ), but isntead for the memory of how I received it. The bottle has been over labelled with one that is beautifully designed and reads, "Massimo Vignelli 80th Birthday Celebration". When I eventually found the bottle I wiped away the light covering of dust and just stared at it for a moment, recalling my memories from the day that I met my design hero, Massimo Vignelli. In 2009 I was offered the fantastic opportunity to live and work in Cape Town, South Africa. When my wife and I stepped on that plane from London to Cape Town, I had only signed up for a period of six month to a year as creative director of a start up business, to employ, mentor and grow a design studio. I would of never believed in my wildest dreams that over six years later we would still be here, let alone, also have our son born in the country. The business has also established itself and over the years we have picked up some pretty impressive clients. I would also of not believed that I would get the great opportunity to meet (and in some cases even work with) some of designs most respected figures, but that is indeed what happened. Massimo Vignelli, Michael Wolff, Vince Frost, Neville Brody, Michael Bierut to name just a few!!! In 2011 I had the great pleasure to meet Massimo Vignelli. He had been re branding one of South Africa's largest retailers who were also clients of the business that I had moved to Cape Town to work with. I had been kindly invited to Massimo's Cape Town leg of his 80th birthday party. It's not everyday you get to meet one of your heroes and this meeting will always stay with me. I must say a huge thank you to the kindness of the Woolworths design and beauty team who are far more than just clients to me, but a team of guys who I have had the great pleasure to work alongside, learn from and have made some super friendships with over the past three years. 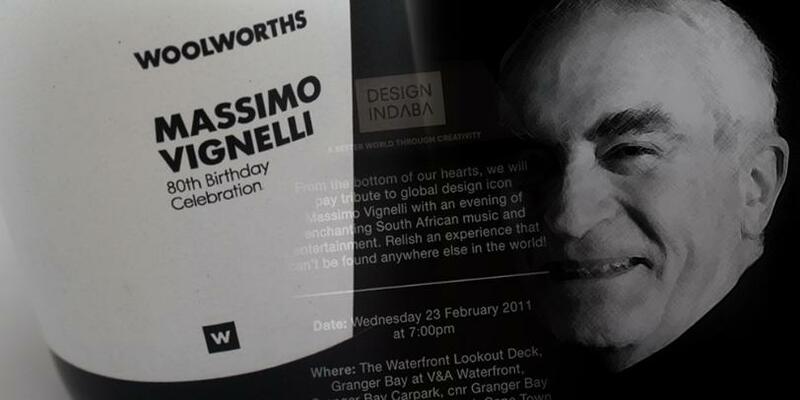 It was thanks to them I got the invite to the Cape Town leg of Massimo Vignelli's 80th birthday party, that also coincided with the Design Indaba. Massimo was another hero of mine that didn't disappoint. To hear him and his wife Lella speaking will always stay with me. The couple spoke with such grace and integrity, both looking so, so stylish. The venue was Cape Towns 'Lookout bar', situated close to the V&A with amazing sea views and it was jam packed full with well known designers and industry leading figures, many who had spoken earlier at the design Indaba, including Pentagrams Michael Bierut, Coca-Cola’s vice president of innovation David Butler, VSA Partners Dana Arnett, title sequence designer Karin Fong and co-founder of Wolff-Olins Michael Wolf (also a hero of mine). As I walked up to Massimo, I would be lying if I didn't say that I felt just a little bit intimidating by his presence. It wasn't anything that he did but instead how I had viewed him. He was the creator of so many of the worlds most recognised brands and someone who I had studied and admired from afar since I discovered his work at secondary school. Some people admire celebrities of television, film or music but for me it was designers and their work and now there was Massimo, stood in front of me in his black turtleneck. After I introduced myself and our conversation began. He was interested in what I said and spoke with an enormous amount passion… Any intimidation I had suddenly receded and I began to really enjoy our conversation. I remember discussing his thoughts on hthe work he had done for the new Woolworths, about fonts, and a little about his book the Vignelli Cannon. At 80 years old, Massimo's was still actively designing brand identities for some of the worlds largest companys. You only do that when your doing something that is your passion.. When you love it. I left our meeting inspired and hoping that I too will my work enough to also practice long after the time that many decide to retire. If your a young or aspiring designer and you haven't read the Vignelli cannon, then your doing yourself a huge disservice. get yourself over to his website now and download it for free. So we are almost at the close of 2011 and tickets are already on sale for next years Cape Town Design Indaba. Don't miss out. It's an incredible event, and who knows. You may get to meet some of your design heroes.